N. E. Dennis raised the question of whether the portrait of Augusta Bicknell could be attributed to William Gush with certainty. Dennis opened the discussion with some background information explaining why the portrait is highly likely to be painted by Gush. The sitter is believed to be David Cargill’s second wife, Augusta Bicknell, and therefore may have been painted as a companion piece to the portrait of Cargill by Gush in a similar style. Tim Williams outlined that the painting of Augusta is the same size as the one of Cargill (75/76 x 63 cm) giving a greater indication that Gush painted both. Williams added various links to the discussion including Gush’s autograph and biography, as well as the diary of David Cargill. Making a promising case, Williams suggested that all the evidence pointed to Gush, especially after confirming that the portrait of Cargill can definitely be attributed to him. Lou Taylor (Art Detective Group Leader, Dress and Textiles) analysed the grey silk dress of Augusta and suggested that the painting can be dated to the early 1840s due to the complex style sleeves. Further research into the life of David Cargill by Barbara Bryant (Art Detective Group Leader, Portraits: British 19th C) supported Taylor’s suggestion and pointed to 1841 as the date of the painting’s creation. Barbara highlighted that Cargill’s first wife died in 1840 and he then set sail for Tonga in 1842, where he died in 1843. This left 1841, the year he married Augusta, as the likely date, considering he was in the UK and would have had time to commission the paintings. Moreover, as Cargill and Augusta Bicknell were only married for two years, this theory seems even more likely. 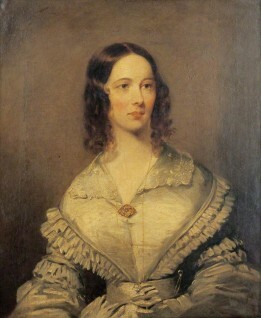 Bryant gave further contextual information on Gush’s life, dismissing speculation that the sitter depicted could be Cargill’s first wife Margaret on the basis that they married in September 1832 and set sail for the South Pacific one month later, hardly giving time to arrange for portraits of themselves to be painted and perhaps too early in Gush’s career for him to have executed them. The discussion concluded that the painting can be attributed to William Gush and dated c.1841. The University of Aberdeen has amended its catalogue record in confirmation. Can anyone confirm the attribution of William Gush (1813–1888)?